Usually when upgrading you expect nothing but improvements. So it can be really disappointing when after moving to Excel 2010 you have no chance to access your .xls file created in the application version 2003 and earlier. You understand what I'm talking about if you ever encountered "The file is corrupt and cannot be opened" error in Excel 2010. Still think you can't open it? Actually you can! Click on File -> Options. Select Trust Center and press the Trust center settings button. Uncheck all the options under Protected View and confirm by pressing OK. Restart Excel and try to open the broken Excel documents. Note. For safety reasons, you should save your document with new Office format like .xlsx. You can do it this way: File > Options -> Trust Center -> Trust Center settings -> Protected View. 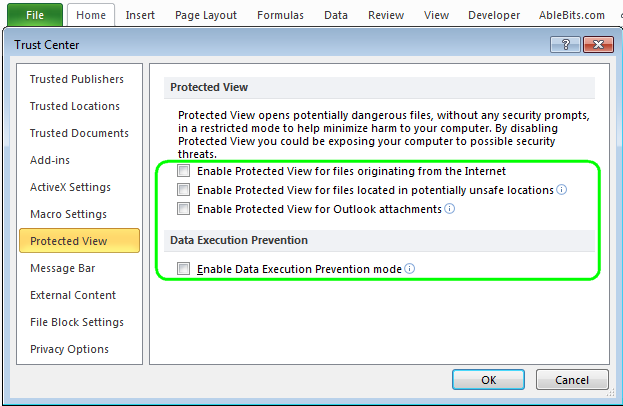 Check all the options again under Protected View, click OK and restart Excel. This will set the security options back. Sure, you don't want to open any file unsafely. That's it. Hope it will work for you and your documents :). 298 Responses to "Get rid of "The file is corrupt and cannot be opened" in Excel 2010"
If you are getting error message "The file is corrupt and cannot be opened" in Excel 2010 while trying to open any of your saved excel document then you can fix this issue by using MS Excel Repair tool. It is especially designed to resolve the error that occurs while using the excel file. I saved my files in my flash drive, unfortunately my flash drive has been corrupted. I am trying to open my recent excel files, but it says could not be found, check the spelling of the file name and verify that the file location is correct. Is there any possible way where I can save and open my recent documents. You are a genius!! Been searching the answers for years and bingo you are good! THANK YOU SO MUCH!!! It worked for me!!!! Thanks so much! I was having trouble with an Excel file after upgrading to Windows 10 (file had been opening fine before the upgrade) and this fixed it. Thanks bro!! I was almost breaking this PC! this worked! Thanks very much! No protected view in my excel option. Its work for me when I uncheck all open in file block settings under trust center. 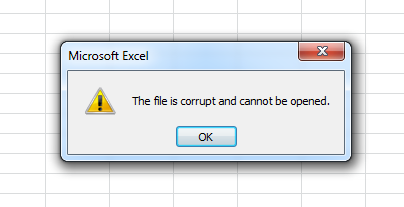 I have a file that has the same message when opened in excel 2007 "The file is corrupt and can not be opened". But I still open it in excel 2010. Worked like a charm...Thanks a ton...!!!! "Thank u so much for this info.my issue is resolved." "excel file not open because file format or file extension is not valid verify that file has not been corrupted and file extension match the format of file"
Thanks a Lot, Now its working. It fixed but setting does not retain after system restart. I have tried this settings and also tried the dcomcnfg settings but still the problem is not resolve.I have also repair the MS office 2010 but no use.Still the files are showing the same error. Yesterday I had a password protected spreadsheet open for a couple hours. I saved and closed the file, then about 3 hours later I went to open it and it said the file was corrupted and couldn't be opened. Also the date of the file was from the previous day not yesterday. I have tried all the online solutions I can find as well as yours and they do not work. At work I use Excel-2010 and at home I use Excel-2016 This is a very important file to me, Can you help? I had excel sheet (no backup) which i opened after 10 days, now it shows .xls: file format is not found. I tried using repair and open option and unfortunately not working. You sir, Deserves a Cookie!!! Someone pls reply if u know the route cause i lost my most imp excel and i dont have any copy of it. Thanks to Mr.Rajesh Peshiya who helped to recover all data from that file. Thank you so much i got back files which corrupted. thanks a lot it is working ! You save our time !!! Ella Kollak. You save our time !!! Simon. Hi good afternoon, can someone help me to restore my excel file. It became 0 byte and cannot be opened, Thank you in advance. Odd. Two machines in our office, and only one had this problem. 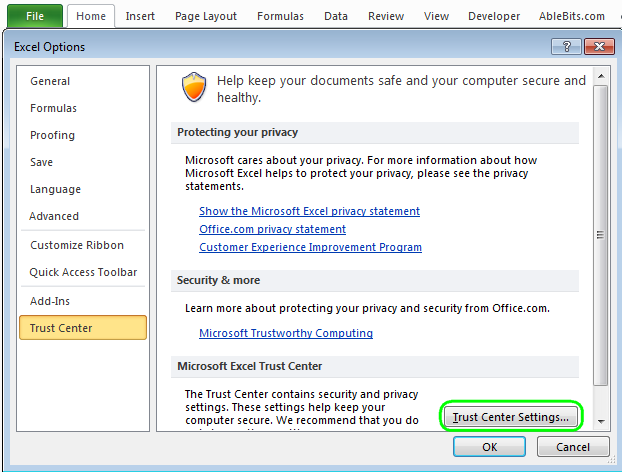 The Trust Center settings were identical for both in both Word 2010 and Excel 2010. But one of them would not open downloaded files at all, always saying they were corrupt. Your solution did work, but it doesn't make sense that it's a problem on one machine and not the other. thank you so much you save my life !!!!!!!!!!!! Worked as a charm! Thanks! I am using Php to export the data from the database to excel sheet. I have a similar problem, but nothing to do with an upgrade. I have a macro enabled file open in XL2003, which originated as an xlxs file from XL2010. Conversion to an xls file was straightforward. I then in 2003 added the macros. It is now saved as an xlsm file, and when XL2003 saves it is reports that the file is being converted. Until the latest changes to the macros, the file could be saved, closed and re-opened. Now the macros do all they should do, the file can be saved, but if I close it it cannot be opened. XL reports that the file is corrupt. I can go, and have gone, back to an older version (v3) to make the changes again. Which I have saved now as v5. v4 cannot be opened by XL2003 on the original machine (the machine that saved the file). v4 and v5 cannot be opened on a different machine by XL2010. I am reluctant to close v5 on the original machine until I know that I can open the saved version elsewhere. Does anyone have any clue as to what may have happened? I am at a loss. I understand file corruption, and that a corruption may occur during the save operation, but do not expect it to hit what is really the same file (the v3 file saved as v4 and v5) in the same way on two different occasions, so I have discounted any file system or OS corruption. It may be something introduced by the converter that XL2003 is using when saving the file, but I do not understand why the converter would add to the file something that XL2003 does not understand. But even if it did, I would then still expect a later version of XL (XL2010) to be able to read and open the file. I'm facing the same issue after upgrading my office 2010 to 2016. .xls file is not opening and getting same error "the file is corrupted and cannot be opened" even .xlsx file working fine. this suggested is very helpful to me. thanks team ! Fantastic! it works. U save my day. Thank you. This method works but it can be dangerous for document. if you another way to solve this issue then please suggest me. I searched on internet but not got good idea.